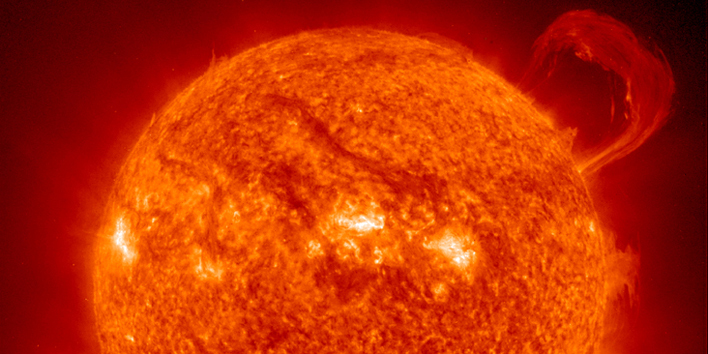 Plasma erupts from the sun in the shape of a massive handle. The sun is a star, a hot ball of glowing gases at the heart of our solar system. Its influence extends far beyond the orbits of distant Neptune and Pluto. Without the sun's intense energy and heat, there would be no life on Earth. And though it is special to us, there are billions of stars like our sun scattered across the Milky Way galaxy. SDO will study the sun's influence by observing the solar atmosphere simultaneously in several wavelengths. The orbiting observatory will help determine if it is possible to make reliable space weather forecasts. Editor's Note: This section provides a brief overview of the sun. For a comprehensive look at the sun and the effects of its extended atmosphere on the Earth, visit NASA's Heliophysics Science Division. "Although the space business is hard work, the rewards are more than worth it. You will discover things that no one has ever thought of before."